Umzuzu's formal recommendation is to fully embrace Gmail and learn to leverage it from its default Settings. Gmail, like all modern technology, is constantly evolving. Features are well thought out to improve productivity and make full use of Google's massive computing infrastructure. As the Gmail team adapts to changing times, they know most people work from the default Settings and must make decisions accordingly. You know Outlook, this technology thing is confusing enough and you want to know how to make Gmail work more like Outlook. Here you go! 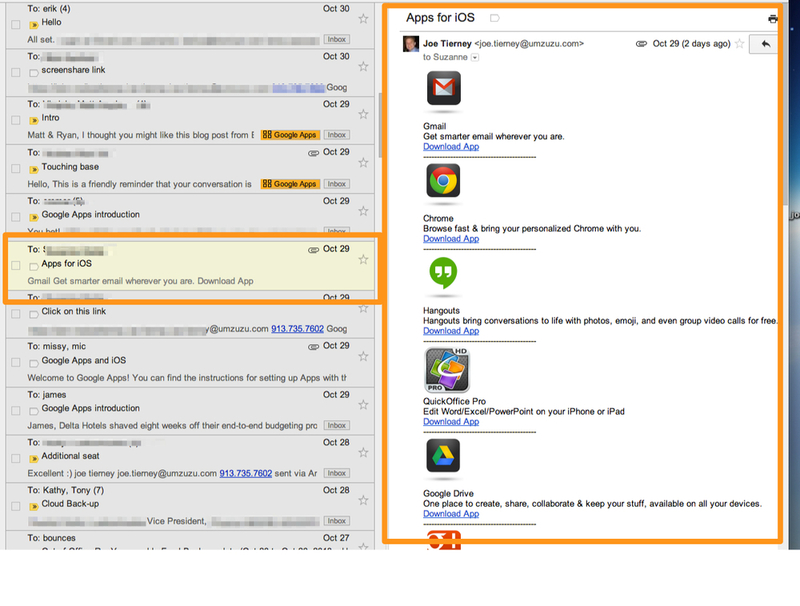 Conversations are represented by the numbers, the circled number in Gmail is 1 Conversation which includes 22 individual messages. Gmail groups related messages, based on the Subject line, as Conversations. Web apps are much faster and more open than their desktop counterparts. When you're in Outlook, you're not going anywhere - you're in Outlook. When you're in Gmail - you're on the Web. The Web is limitless. It's easy to get confused if you don't spend a lot of time on the Web. Turning Conversations off slows down the pace of Gmail, a slower pace that's more in line with how Outlook processes mail. To break a Conversation string, you can also change the subject. Turning off Gmail Conversations is extremely easy. Just go to Settings, you'll see the option right there on the first page. Preview Pane is a Lab, which means it's not technically supported and can go away at anytime. My guess, Preview Pane will stick around. I think a lot of former Outlook folks have this Lab turned on. 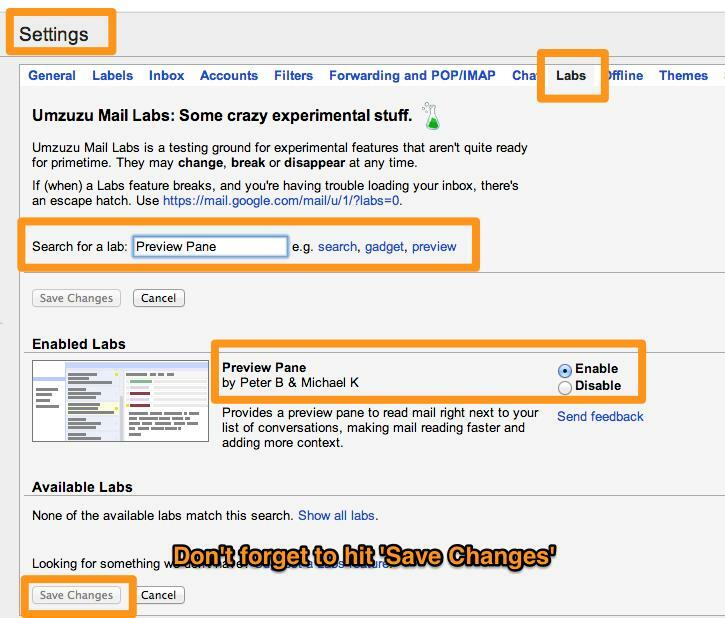 Once you have the Lab enabled, you'll be taken back to your inbox and a new menu item is present in the upper right of Gmail. You now have the ability to create a "vertical split", a common Outlook configuration or a "horizontal split" which you see used in Outlook a lot as well. Folders are a coping mechanism. Search is a very resource intensive process, Outlook only has the power of one computer to work with so it's ability to search is limited compared to Gmail, which leverages thousands of computers. So in Outlook, we use Folders to give ourselves a chance of finding a message when we need it. In Outlook, we actually spend more time organizing than communicating with people. 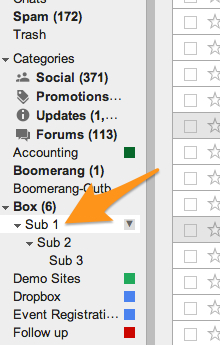 When we move to Gmail, we can mirror these folder hierarchies. In Gmail we can also move massive amounts of mail in a few seconds, for example we can move 10 GBs of mail for one Label to another in few moments. You can also create as many 'subfolders' as you'd like. 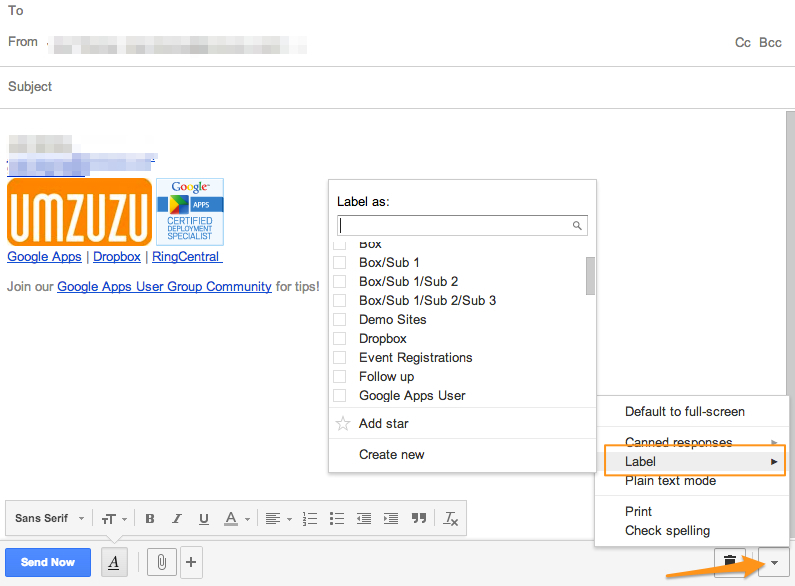 You can move a Label under any other simply by editing the Label and selecting the "Nest label under" check box. Labels can do a few things Folders can't. With Folders you have to make a decision of which Folder you're going to use. However, you can apply multiple Labels to a single message - this way regardless of where you look, you'll find your message. You can even apply a Label to a message before you send it! You can also drag and drop messages or groups of messages in Labels, just like you would folders. As you mouse over any message, you'll see a little "grip" show up on the far left of the message (or conversation!) row. You can "grab" the row with your mouse and move it into your Label. 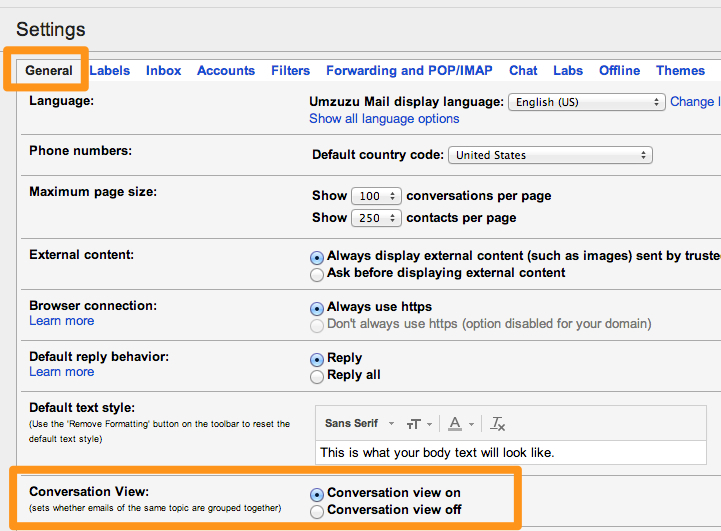 This is the "Move to" action in Gmail which you can also do from the top menu when a message is selected. To drag and drop multiple messages, just check the box of all the messages you want to move and grab the "grip" on one of the selected messages, the whole group will move. In conjunction with Foldering, Sorting is a popular way for Outlook users to find the content they need. It can very frustrating when you move to Gmail and aren't sure how this can be done. There are a few tips that can help. Gmail has exponentially more horsepower than its desktop counterpart. By default Gmail always searches across "All Mail" so you don't have to go to a Label (aka Folder) first and then search. This is super CONFUSING if you don't realize going to a Label and searching doesn't search just that Label - you always search everything by default. That's silly you say? Not silly, it saves a step. 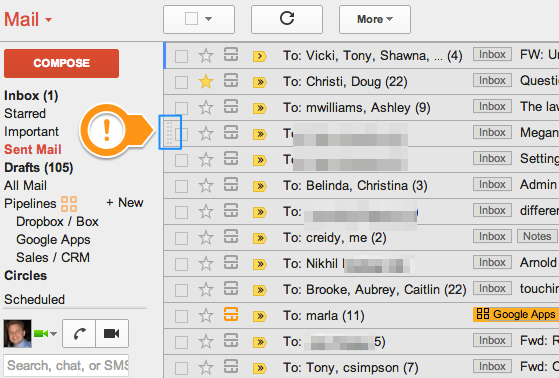 Gmail users don't typically look for a label and then look for a message in that label - they just search. Let's say you want to sort mail from a specific sender, you can do this either with your search query or advanced search. Remembering Gmail Search Operators is easy because Gmail is going to autocomplete most of the for us. You can use search to sort specific labels, specific dates, emails with attachments, emails by size, and much more as well as combine these to find exactly what you need. You can also apply Labels (aka move messages to folders) by using Filters. Filters are used to create rules. Rules to send messages from a specific person to a specific Label and skip the Inbox all together for example. Filters can be applied going forward or retroactively. 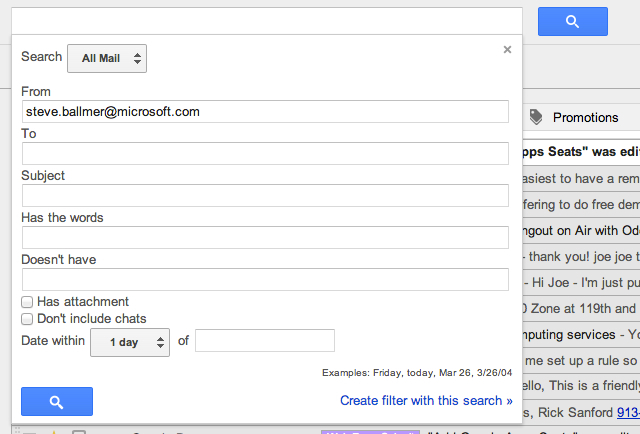 You can create Filters from the Advanced Search dropdown or in Gmail Settings. 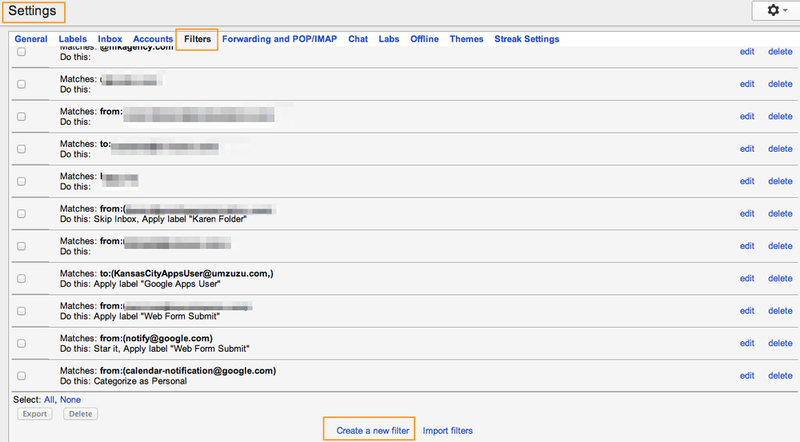 You can create a Gmail Filter or rule from the Advanced Search menu or Gmail settings. Not only will these services work great with Gmail, they'll work great on your mobile device! These tips can help ease your transition while still pushing you in the right direction. Web apps are THE apps of today and tomorrow. The Web is not some lesser or supplemental platform to the desktop, it is going to completely replace the desktop for a vast majority of use cases. Regardless if you're using your Windows machine at work, your Mac at home, your iPad or your Android smartphone - it shouldn't matter. The mobile web is everywhere. The sooner you embrace the Web the better.